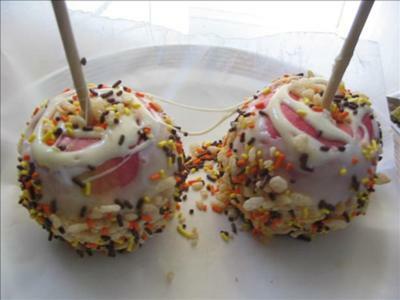 I came up on this twist on candy/caramel apples a few years ago around Halloween with items I happened to have in my pantry. I love candy apples, and I love Rice Krispies treats - it was a fun experiment that turned out great! The marshmallow "spiderwebs" give them a cool creepy look. 1. Stick a wooden stick into each apple. 2. In a medium sized microwave-safe bowl, put marshmallows and butter, and heat on HIGH in the microwave for 15 seconds. Stir. Heat for another 10 seconds and stir. Marshmallows should be smooth and pourable at this point. If not, heat in 10 second intervals until ready. 3. While still hot, dip each apple one at a time into the marshmallow (you may need to return to microwave for a few seconds if marshmallow starts to get stiff). Lightly roll each in crispy rice, and set on a wax paper-covered cookie sheet 1-2" apart. 4. Reheat any leftover marshmallows (you may need to add one or two at this point). With a spoon, drizzle remaining marshmallow over apples, giving them a "spiderweb" look. While still hot, put sprinkles on the coating, if desired. 5. Allow to cool completely before serving. These are very sticky, but tasty!